Kraemer responded to a Canadian National Railway emergency bridge repair request, completing $1 million in emergency repairs working 24/7 over eight days. 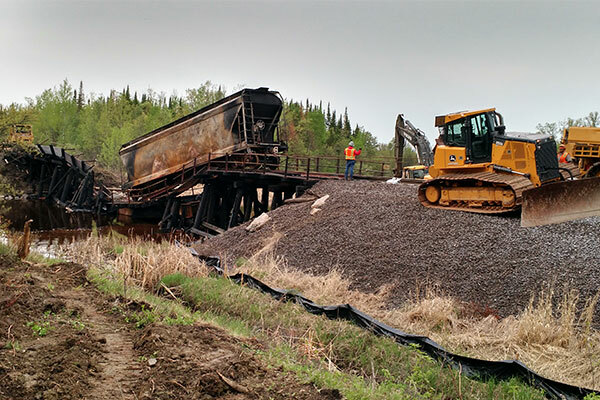 The timber bridge burned and collapsed near Ericsburg, MN in Koochiching County, tipping two rail cars onto the banks of the Rat Root River and temporarily blocking a Canadian National Railway artery that connects the Pacific Coast to Chicago, IL. The emergency repair effort included the placement of a temporary shoofly detour, the design-build construction of the temporary structure and access platforms, precast staging, erection setup, and completion of the new permanent structure.